Virtualizing the operating system on a physical server can be the key to preserving its applications and migrating it to faster hardware that it may not support on its own. It also enables the operating system and applications to be easily migrated to internet-based, or "cloud" servers, potentially lowering future maintenance costs and ensuring "run forever" status. 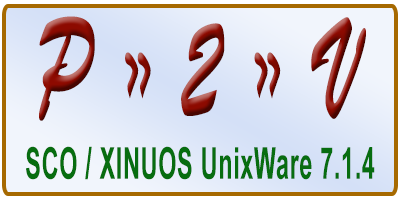 Xinuos (formerly SCO) UnixWare 7.1.4 can be a rather difficult operating system to virtualize or migrate to new hardware. Its lack of an easy method to change host bus adapters is one of the primary issues when needing to perform a migration or Physical to Virtual (P2V) machine conversion. Enables P2V conversions to VMware ESXi 4.1 and above. Allows the target virtual machine filesystem sizes to be modified as necessary. They may be grown or shrunk as needed. Allows physical hard drives to be consolidated into fewer virtual drives in many instances. Enables and optimizes host bus and network adapters compatible with VMware. Allows the VMware virtual console to be used in character or graphical mode. Preserves the UnixWare 7.1.4 license. UnixWare 7 Definitive is not required. The resulting virtual machine can have as many CPUs and as much RAM as UnixWare 7.1.4 and VMware support (with proper licenses). From device drivers to mouse and video support, no one has ever created a procedure as comprehensive as this one. The Procedure is always performed by a representative of Microlite Corporation, preferably over a GoToMeeting session, but may be performed on-site if desired by the client. The source server must have a fully licensed copy of UnixWare 7.1.4. This license will transfer to the destination server. The source server must be completely up-to-date with using the PATCHK tool from SCO / Xinuos. The source server must have a current copy of BackupEDGE installed, with a 2 Year Support and Maintenance Subscription. This license will transfer to the destination server. Some client applications that are inode-locked or have other license locks may need to be re-licensed after the procedure. Please check with any software vendors on their re-licensing procedures. The SCO / Xinuos operating system license will remain activated but will request re-registration after this procedure is complete. Microlite will prepare an engagement letter for the client to sign prior to scheduling any work. Site Survey consulting fee of $500.00 ($600.00 if outside of normal Microlite business hours). This includes two hours of time for examination of “sysinfo” files generated from the physical server, followed by a GoToMeeting session where the project engineer will examine the physical server, confirm the findings from file examination, and ensure that the SCO/Xinuos “patchck” program has been run to update the physical server with all of the latest operating system patches and updates. P2V procedure fee of 1 day at $1,250.00 ($1,500.00 if outside of normal Microlite business hours). Included with this fee, and prior to the P2V date, Microlite Corporation will perform all preliminary work necessary to facilitate the final P2V procedure, and will make necessary files / drivers available to client for readiness. P2V conversion are done via GoToMeeting session. On-site conversions can be perfomed at travel rates to be negotiated.